Faculty and staff, we need your help. 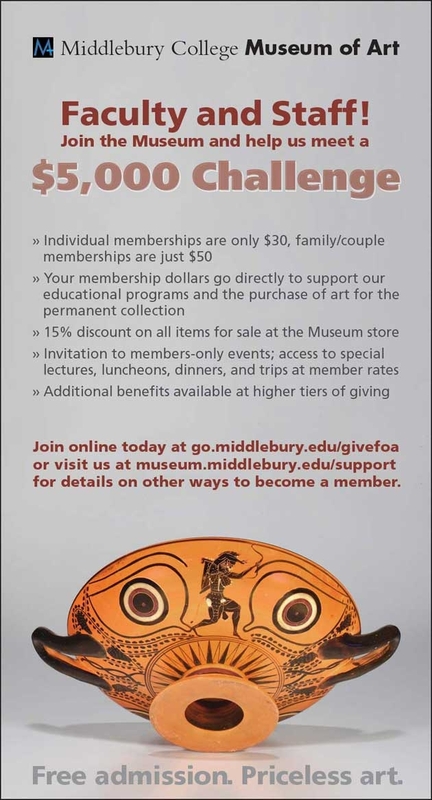 The Middlebury College Museum of Art has received a gift that will match each new membership by faculty and staff, up to $5,000. We’re proud that our Museum is free to the public, but it is not without cost. The exhibits we organize or bring to the College are here for you, our students, and our extended community. Please show your support by joining the Museum. It’s easy to join online, or you can visit the museum’s website for details on other ways to become a member and to learn more about the benefits of membership.